3 hourly Space Weather Conditions and Forecast (WWV.txt) Issued every 3 hours. 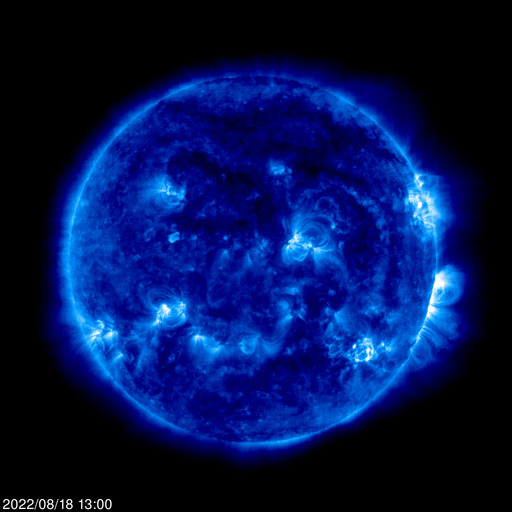 The messages contain recent solar and geophysical indices, plus a summary of recent significant activity and a forecast of activity in the next 24 hours (based on NOAA Space Weather Scales). Solar flux is a measurement of the intensity of solar radio emissions with a wavelength of 10.7 cm (a frequency of about 2800 MHz). The A and K indices are a measurement of the behavior of the magnetic field in and around the earth. The K index uses a scale from 0 to 9 to measure the change in the horizontal component of the geomagnetic field. The A index is a daily value on a scale from 0 to 400 to express the range of disturbance of the geomagnetic field. from the announcement. Space Weather describes the conditions in space that affect earth and its technological systems. Space weather is a consequence of the behavior of the sun, the nature of earth’s magnetic field and atmosphere, and our location in the solar system. The K-index, and by extension the Planetary K-index, are used to characterize the magnitude of geomagnetic storms. Kp is an excellent indicator of disturbances in the Earth’s magnetic field and is used by SWPC to decide whether geomagnetic alerts and warnings need to be issued for users who are affected by these disturbances. This chart updates every minute. The Estimated 3-hour Planetary Kp-index is derived at the NOAA Space Weather Prediction Center using data from the following ground-based magnetometers: Sitka, Alaska; Meanook, Canada; Ottawa, Canada; Fredericksburg, Virginia; Hartland, UK; Wingst, Germany; Niemegk, Germany; and Canberra, Australia. These data are made available thanks to the cooperative efforts between SWPC and data providers around the world, which currently includes the U.S. Geological Survey, Natural Resources Canada (NRCAN), the British Geological Survey, the German Research Centre for Geosciences (GFZ), and Geoscience Australia. 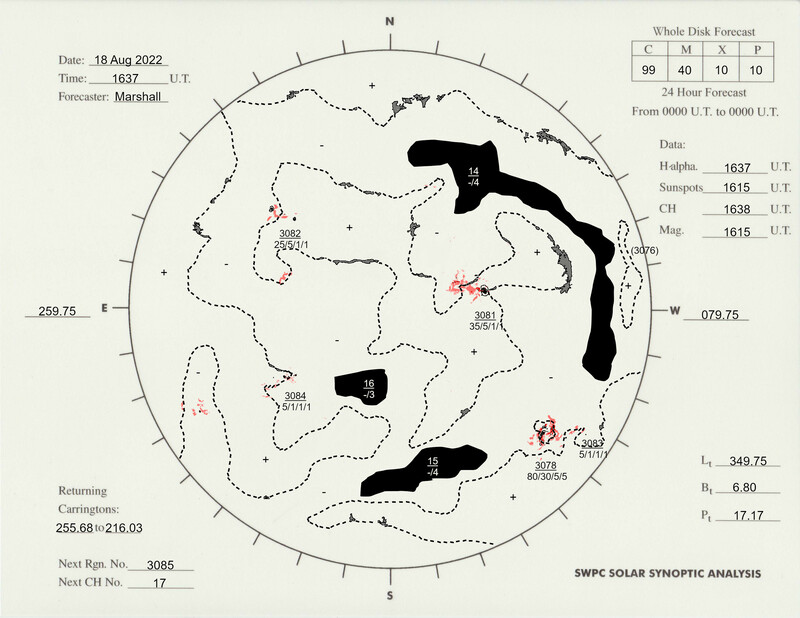 Important magnetometer observations are also contributed by the Institut de Physique du Globe de Paris and the Korean Space Weather Center K-index Watches are issued when the highest predicted NOAA estimated Kp-indices for a day are K = 5, 6, 7, or >= 8 and is reported in terms of the NOAA G scale. K-index Warnings are issued when NOAA estimated Kp-indices of 4, 5, 6, and 7 or greater are expected. K-index Alerts are issued when the NOAA estimated Kp-indices reach 4, 5, 6, 7, 8, or 9. 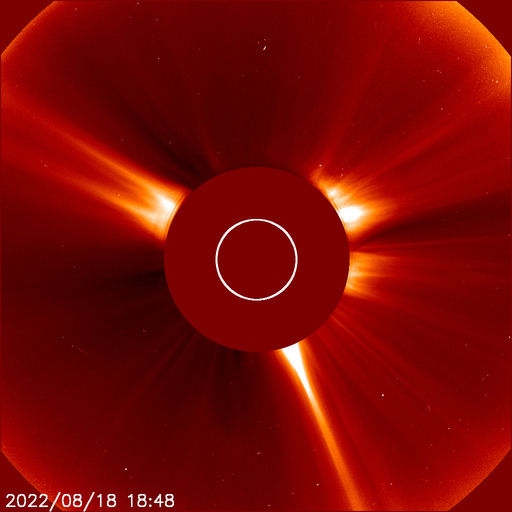 LASCO images have been used by the SWPC forecast office to characterize the solar corona heating and transient events, including CME’s, and to see the effects of the corona on the solar wind. More recently, the LASCO images are vital to the WSA-Enlil model that became operational in October of 2011. WSA-Enlil has become an important tool for forecasting the impact of Coronal Mass Ejections and the effects of the Solar Wind on the Earth. The Large Angle and Spectrometric COronagraph (LASCO) instrument is one of 11 instruments included on the joint NASA/ESA SOHO (Solar and Heliospheric Observatory) spacecraft. SOHO was launched on 2 December 1995 at 0808 UT (0308 EST) from the Kennedy Space Center, Cape Canaveral, Florida. The LASCO instrument is a set of three coronagraphs that image the solar corona from 1.1 to 32 solar radii. It is convenient to measure distances in terms of solar radii. One solar radius is about 700,000 km, 420,000 miles or 16 arc minutes. A coronagraph is a telescope that is designed to block light coming from the solar disk, in order to see the extremely faint emission from the region around the sun, called the corona. 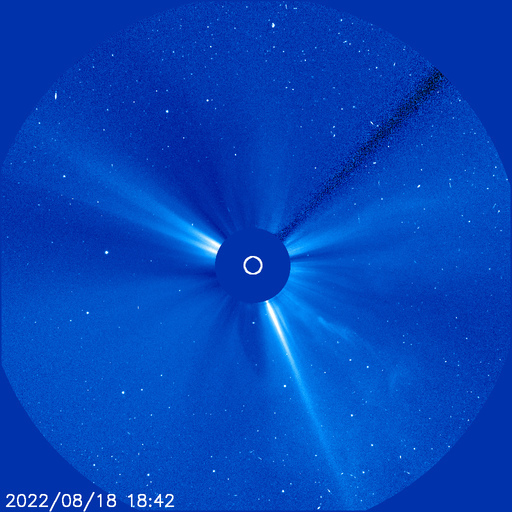 The LASCO coronographs are part of the SOHO suite of instruments that were launched in December of 1995. SWPC has made use of the coronograph images in their forecast office since they have been available, and more recently in the WSA-Enlil model. The OVATION (Oval Variation, Assessment, Tracking, Intensity, and Online Nowcasting) model is an empirical model of the intensity of the aurora developed at the Johns Hopkins University, Applied Physics Lab by Patrick Newell and co-workers. The model uses solar wind and interplanetary magnetic field (IMF) conditions at the L1 point, upstream of Earth towards the sun, as inputs. The model produces an estimate of the intensity of the auroral energy at locations on Earth. For this product, it is assumed that there is a linear relationship between intensity of the aurora and viewing probability. This relationship was validated by comparison with data from the Ultraviolet imager (UVI) instrument on the NASA Polar satellite. During intense solar energetic proton events (SPEs), the solar wind high-energy proton levels can be so large that they contaminate the ACE solar wind velocity and density measurements used to drive this model. In those instances, an alternative estimate of the solar wind forcing, based on the work of Machol et al., (Space Weather Journal, DOI: 10.1992/swe.20070, 2013) is used as input to the OVATION model. 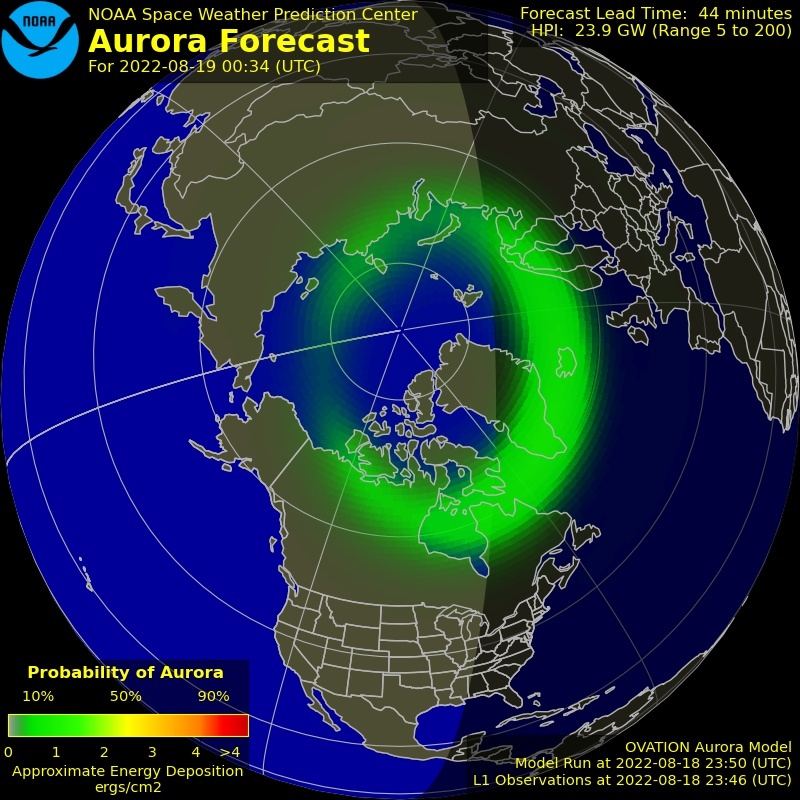 Space Weather Message Code: ALTTP2 Serial Number: 1073 Issue Time: 2019 Apr 22 0424 UTC ALERT: Type II Radio Emission Begin Time: 2019 Apr 22 0255 UTC Estimated Velocity: 428 km/s NOAA Space Weather Scale descriptions can be found at www.swpc.noaa.gov/noaa-scales-explanation Description: Type II emissions occur in association with eruptions on the sun and typically indicate a coronal mass ejection is associated with a flare event. 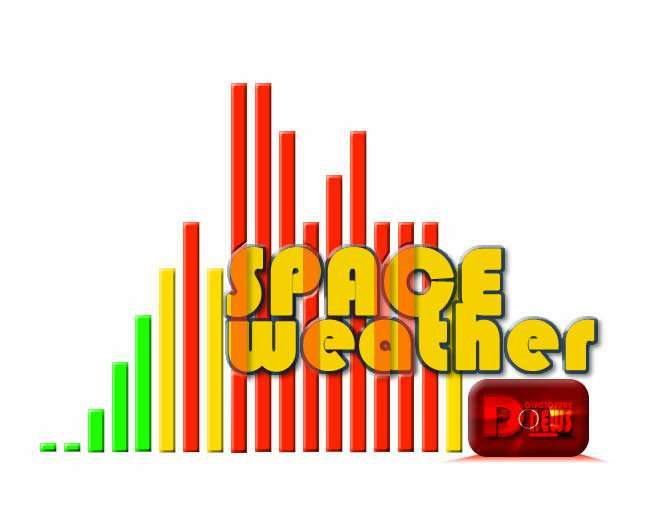 Space Weather Message Code: ALTTP2 Serial Number: 1072 Issue Time: 2019 Apr 21 0533 UTC ALERT: Type II Radio Emission Begin Time: 2019 Apr 21 0444 UTC Estimated Velocity: 1341 km/s NOAA Space Weather Scale descriptions can be found at www.swpc.noaa.gov/noaa-scales-explanation Description: Type II emissions occur in association with eruptions on the sun and typically indicate a coronal mass ejection is associated with a flare event.